With rhyming text and beautifully painted illustrations, this lovely picture book celebrates the minutiae of a child's day. The poems in this book describe the activities of such things in the daily round such as birds, bees, acorns, rain, and spiders. This would be a great mentor text to help young writers dig deeper when writing descriptively. Surprised by this lovely book - haven't heard much about it, but it's a mentor text for sure! Although a story, really it's a collection of poetry. Love how they are centered around a child's day. Love the use of vocabulary. Wonderful kid appeal,mand would pair well with NOW. Kids will have an eye-opening insight about appreciating and experiencing THE MOMENT! Beautiful illustrations that go so well with the lyrical words of each page. This reads like a collection of poems, telling about what you should do if you're rain, the moon, boots, an acorn, etc. Rhyming text helps it flow nicely. Would be a great read-aloud for k-2nd. Love that it's nature-based and provides information. 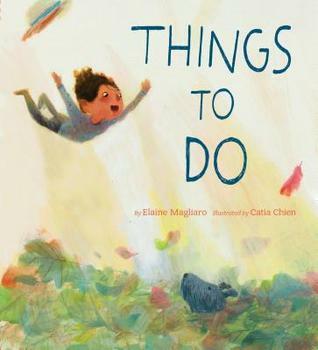 Beautiful book of poems in different situations and parts of the day, all in the format of "Things to do if you are _____." Would make a great writing mentor text in the classroom for poetry and figurative language, and also for lessons on perspective. The soft, blur-edged illustrations are gorgeous! Always a fan of Catia Chien's illustrations and the text here is full of empathy and lyricism. I've enjoyed Elaine's poetry for a long time. She is especially talented in showing what any object thinks, or does, in poetic ways. I read the poems and am in awe of the new ways she looks at the world.This time, the poems are about everyday objects and what they do when we look at them through their eyes.Catia Chien creates dreamy illustrations for each double-page spread. Elaine begins to show us wonders with the day's beginning, She begins each part with "Things to do if you are. . ."This first page shows "Things to do if you are Dawn" and begins "SHOO away the night." Sunlight streams through a window as a young child opens curtains to greet the day. Seeing this, you know it's going to be an exciting journey throughout the day.Another favorite part takes TWO double page spreads, to show "Things to do if you are an ACORN". One thing is to "wear a bumpy, round cap." It ends delightfully with "Then, in spring, SPROUT. Let a little OAK out." On a SKY page, Elaine asks the sky, "Don't grow grumpy, gray, and frown." I won't reveal the last page, but ends this beautiful day, of course, with the moon.Not everything happens during the day in nature. There is a double page that capture another kind of action. I loved reading and seeing each page, and believe this would make a lovely entry into poetry for young writers. What might they say if they imagined what "something" would do? Follow the path of a day in this poetic picture book. Little things in life are captured on the page along with weather and seasons. The book begins with dawn and the things that dawn does, then moves to the outdoors with birds and acorns. Sun, sky and eventually moon appear and do their things as well. Rain arrives, boots come out. There are spiders, snails and crickets that appear too. Each given a poem about what they do and the small beauties they create in our world.Magliaro’s poetry is exceptional. On the very first page, readers are drawn into viewing the world through her lens that looks at small things, captures them and then moves on to the next. Each poem is separate but linked, creating an entire universe of things to do and things to see. The poetry is sometimes rhymed, sometimes not, often ending in a rhyming couplet. It is the rhythm that ties it together, moving forward, lingering and then onward.Chien’s illustrations are soft and ethereal. She creates dawn light then bright sun and finally a huge moon that fills the pages. Each time of day is unique and special, given space on the page to shine. There is a rough softness to the images, landscapes that blur rain that shimmers.A top-notch poetic read for children, this book celebrates small moments made large. Appropriate for ages 4-6. An unassuming book that opens nature’s world to readers. Readers gently explore things to do if you are dawn, a bird, a honeybee, or even a snail. Written in a poetic voice, each section begins with “Things to do if you are..” Each section explores the subject, enlightening it with descriptors, some known by readers, some new to readers. The book invites readers to ponder the descriptions and experience them for themselves. Loose paintings rendered in acrylic, further invite readers into the story. The day ends with crickets and the moon that “Hang(s) in the darkness,” and “Dazzle(s) the night.”A quiet book that brings awareness to, explores, and expands in detail the many things in a child’s day. Reading for CLAU long list. I believe if I understood and got poetry better, I would find this amazing. I would be able to critique the poetry part with wise, profound words and explanations. But I can't. I'm just a titch away from fully getting it. Yet I leave it with a sense of awe and wow. And maybe that's one of the many things that poetry is all about.I was intrigued by the illustrations. Not loving them, but they matched the different aspects of the day that we follow with the boy and his dog. And they are cute, clever ways to look at everyday things we encounter. How should you spend your time if you're a honeybee? How about if you're an eraser or a pair of boots or an orb spider? Clever poems from the point of view of insects, animals, and objects. Lots of imaginative wordplay! Sample from "Things to do if you are an acorn": Tempt a scavenging squirrel. / Let him bury you in a bed of earth / beneath a blanket of moldering leaves. / Dream the winter away. / Then, in spring, / sprout. / Let a little oak out! This book is strikingly poetic, utilizing all kinds of rich vocabulary to describe the things that everyday objects do. From acorns to scissors to rain, the breadth of subject matter is significant. Additionally, the illustrations are soft and sweet, and some words in the text stand out in either size or shape to help with comprehension. This is a wonderful, newish book that I was just completely (and pleasantly) surprised with on a day at the library. It's beautifully illustrated with intriguing and colorful designs. The text rhymes with a lot of figurative language. The story is very imaginative and enjoyable to read. This is a great picture book, and I'm very happy to have stumbled upon it! Can't wait to read this with preschoolers on up, in conjunction with other "How to" poems. ("How to be a Heart," for example.) The language is elegant and the images vivid. Love how "Crickets" changes up the pattern. Love that these can be read singly or all together. Wow. The dawn, birds, honeybees and even acorns have things to do. Nature is happening all around us and we should take note of what it is doing today.Each page reads like a poem. Might make a great mentor text for a writing prompt. A great book with lots of action words! The illustrations are beautiful and make you feel like you are the thing the author is describing. Would be good for storytime if you read a few pages at a time. The whole book would be better for elementary age children. This is one I definitely want to use for April is Poetry Month next year. Beautiful watercolor illustrations with simple poems about everyday things yet with a playful use of language. It might be nice to pair this with some poems from Are You An Echo? featuring the poems of Misuzu Kaneko. Such stunning pictures love how the text form emphasizes the words, stunning pictures. *sigh* This book was the perfect mix of magic and words. Each poem stood alone to perfection while complimenting each other to make this a book to treasure as a whole or in pieces. Oh, this is lovely. The illustrations are wonderful and I loved the poetry. Very poetic and illustrated nicely. But not one for our collection. What a refreshing way to look at the world! Joyful, playful, wonderful poems. The dazzling illustrations just add to the beauty. Highly recommended. I liked how the text extend beyond two pages spreads with some sentences continuing once the page is flipped. The artwork was nice, too.